Hanging out in airports is the down side of travel. And the 5 hours spent in KL airport was no exception. It did give us a chance to chat and laugh and prepare for our holiday. We met up with Di who flew in from Sydney and was rested after her night in the airport hotel. Our flight left on time and I had a little man next to me who was wildly excited to look past me and out the window…… for the whole trip. At one point I had to ask him to back away! We were met on arrival at Danang and driven to Hoi An about half an hour away. The beach front was blocked with buildings. Resort after resort are being built along the water and is changing the landscape and the atmosphere of what was a little village. Trinh, our hostess at the home stay was waiting to greet us and after allocating our rooms gave us a beautiful lunch. Spring rolls and a delicious noodle soup followed by fruit. She knows how to spoil her guests and at $19 US a night is a bargain. 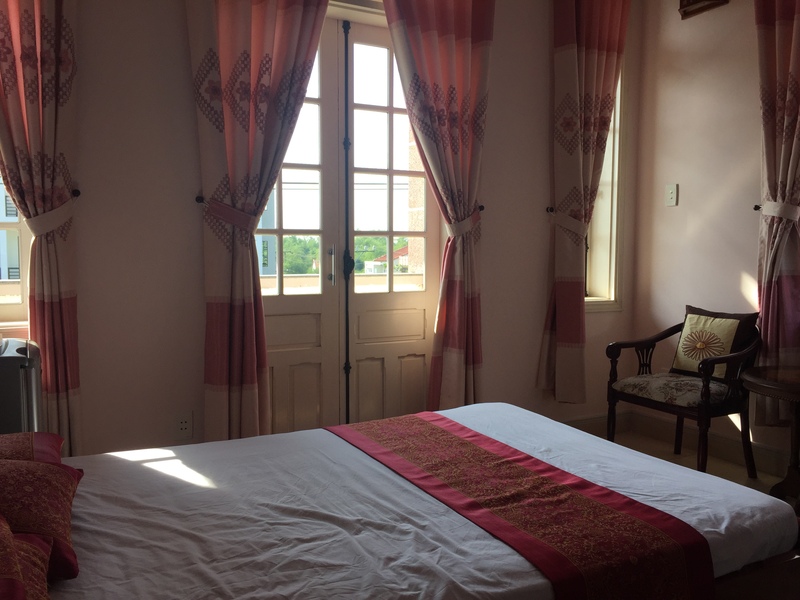 The home stay house is a three story pink house typically of Vietnam. I’m on the 3rd floor up forty steps. It’s huge room, traditionally decorated. Each of us has our own room and share a bathroom between two rooms. It’s the typical open shower style so common here and in Cambodia. We needed a little after lunch sleep in the heat of the day before our 4pm meeting with Trinh to talk about clothes we might have made. In an earlier life Trinh, a human pint sized dynamo ran a fabric and tailor shop. Perfect! We laugh and chatted and then headed off to a fabric shop. It was an Aladdin cave of fabrics. 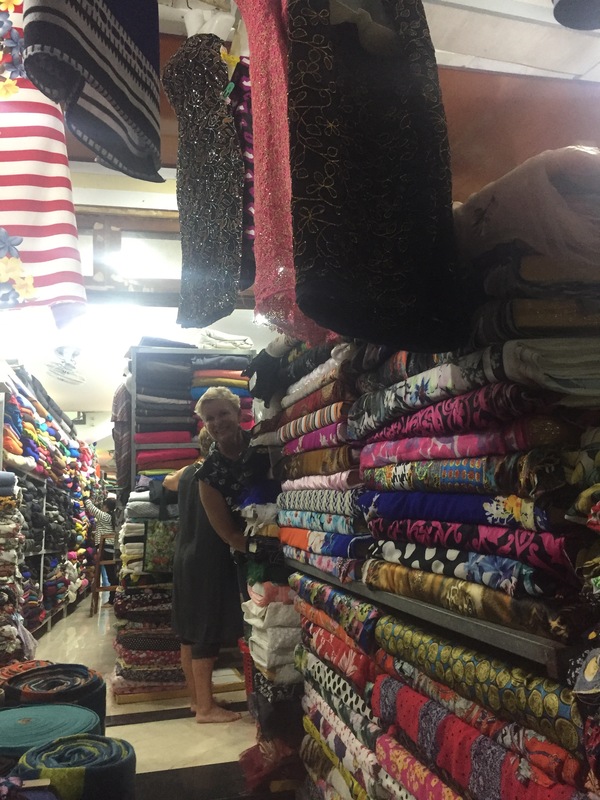 We sorted and encouraged each other as we selected some beautiful silk and cotton fabrics from the hundreds of designs on offer. Trinh guided us with military precision and before we knew it we were packed up and heading to Hoi An old town for drinks. Hoi An is charming and known as the lantern city for good reason. There are hundreds of lanterns all over the town. We found a lovely verandah and settled in with chilled white wine and fresh spring rolls to recover from the fabric overload. Phew. What a first day. We were exhausted so headed back to the Thanh Luan Homestay for some well deserved sleep. Tomorrow we have a 4.30am pick up to visit My Son, a site of ancient ruins from the Cham Empire.